Designed and made according to Kettler’s German-quality standards, the latest Giro M Cycle is a superb exercise “buddy” that boasts grand features and refined looks. Featuring a sturdy 6kg flywheel, it’s adequate for body weights of users of up to 110kg. Giro M Cycle offers 8 levels of resistance augmented by a magnetic braking system that’s manually adjustable. The “nerve center”, its training computer, offers 7 functions coupled with integrated hand pulse sensors. 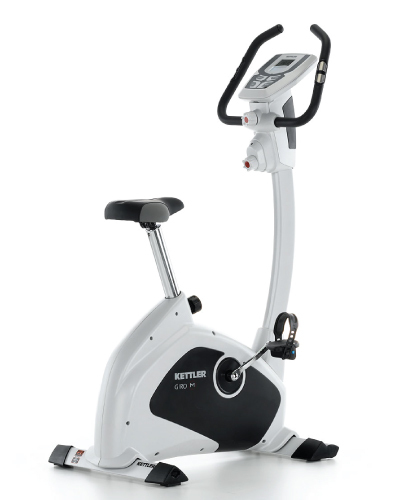 Giro M Cycle is excellent for indoor workouts including in the comforts of your home. Giro M Cycle is also effectively suitable for lower body workouts and calorie-burning. Easy on your joints and ideal for keeping yourself in shape you can chat with your family or watch a favorite program on TV while you work out. Suitable for offices too! The affordably-priced Kettler Giro M Cycle is great value-for-money.